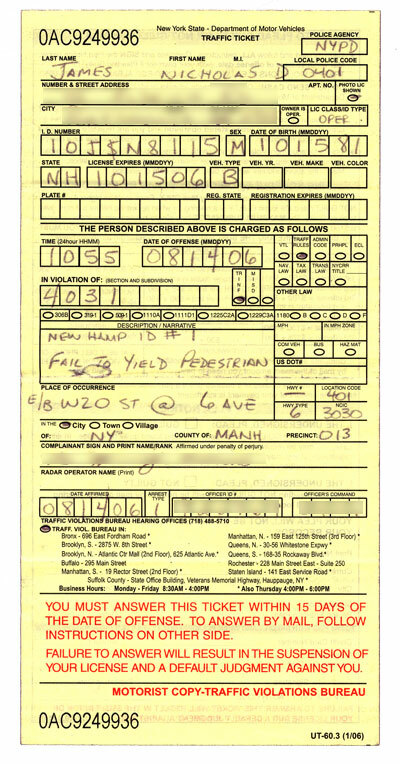 I got a traffic violation today, for turning into the bike lane of a one way street. I did it right in front of two bike cops because I didn’t even realize I was breaking a law. For those of you who bike somewhere other than New York City, be thankful you don’t live here. The cops are out to stop us, but do nothing to protect or defend us. Two bike couriers died last week as a result of being hit/crushed by cars. No charges filed, as far as I can tell. As always, “the biker was at fault.” Of course, when you replace the bicyclist with an off-duty cop on a motorcycle, it’s front page news, and the driver is paraded around in handcuffs on the evening news. I’ve lived in a few places around the east coast, but it wasn’t until I moved to New York City that I began to resent the police and their agenda. I really think they have better things to do in this city than ticketing bicyclists and trying to criminalize our group rides. I won’t let this slow me down though – I’ll just be more wary around bike cops from now on. My next goal is to get a speeding ticket on my bike. Instant cool points right there. Dude, thats a bummer. I got a ticket for rolling through a stop sign when I was 14. As the cop was writing me the ticket, cars next to us didn’t even bother stopping at the stop sign, they just slowed down and punched the gas. Just dont carry ID and give him a fake name? Isn’t that they only way they can connect you to the system, a drivers licence, that is? Nick – there’s been a ticket blitz over the summer to hassle bike riders in NYC. I know a bunch of people who have gotten them. The cops even set up a weird kind of trap on the west side of the Central Park loop and I did actually hear one story of someone getting a speeding ticket in CP, so be careful what you wish for. I don’t know what their point is in ticketing bikers. Seems pretty useless. Fail to yield pedestrians” What?! Did you cut off or side swipe some old lady? You’re right; Cops have bigger and better things to worry about than a bicyclist. No, I didn’t put anyone in danger. The cop actually gave me the failure to yield because it’s a $40 fine vs. $150 for running a red. I don’t think bikes should incur the same fines as cars, and until I have the same rights as a car on the road, I don’t see why I should have to follow the same rules. You’re right about the blitz, eddy. I’m not the only one. So what did you actualy do? In the original post you said you were turning into the bike lane of a one way street. In the comments you seem to indicated the cop cut you a break by giving you a failure to yield vs. running a red. If you ran a red light I think you deserved a ticket. I agree even though laws say bicycles are considered vehicles and have rights like a car, the mass car population doesn’t drive that way. However I don’t think the answer is to just ignore the laws and be all vigilante about it. If the cop cut you a break and made your ticket $40 when you deserved $150 then it doesn’t seem like the cop had an axe to grind against cyclists. Jay, I was on 20th St, which is one-way, turning onto 6th ave, which is one-way with a bike lane. As I came to the red light at the intersection, I slowed to a stop and let the bike cops pass in the bike lane, which was on the left side, where I was. After they had passed, I slowly moved into the intersection to see if any bikes were coming in the lane, and as none were, I turned onto the lane, after which the cops stopped me from behind. I went directly into the bike line crossed no lanes of traffic. There is a difference between running a red light and going through when there is no traffic, especially when you’re turning from one one-way-street to another in a bike lane. I don’t think this cop had an axe to grind against bicyclists. In fact, he was very friendly, especially considering the break he gave me. However, it’s pretty indisputable that the cops are cracking down on bicyclists, considering we all seem to get ticketed on the same day. google view of the intersection. I can see the bike lane on 6th ave, but can’t see it on 20th…though it sounds as if it’s on the left hand side of the road. if you stopped at red, then turned what’s the deal? No turn on red allowed there? I don’t understand what law was broken. And if the cops passed you then came from behind, were they navigating the wrong direction on the roads? I wondered the exact same thing, I just didn’t take the time to look up the map like you did. If Nick was turning left onto 6th…then what’s the big deal? I know in general you can’t turn left on a red, but I don’t think that applies to turning from a one-way to a one-way where the traffic flow is left….Nick? Cop said no turns on red in New York City, end of story. Cars shouldn’t do it for sure, but that’s cause cars shouldn’t drive in the bike lane. I think he said something about cops. bike lanes, trails and for shizzile my nizzle. ebee – not having ID with you is a bad idea. In most states, even for a traffic violation, you can be arrested and taken to the nearest “magistrate” until your identity can be proven to the satisfaction of the authorities. See http://www.velonews.com/news/fea/8843.0.html for an analysis of the legal issues. You CAN get a speeding ticket on a bike… A cyclist in Tucson was cited for speeding in a school 15mph zone. The zone is at the end of a downhill so the cyclist easily made that speed. The report sounded like he didn’t slow down at all. In this case I agree with the ticketing; no one should put children at jeapordy. On another note, in California, turning left from a one-way street to another one-way street on the red is legal, provided there isn’t a “No Turn on Red” sign. However, I do remember that New York state doesn’t allow for turning on red at all. Well, be thankful you got a break. I’m from Queens myself and have lived and biked in both Queens and Manhatan. There are no turns on red anywhere in the city, and considering the population density I think that law makes sense. Although I admit that I’ve done the same kind of thing that you did myself and I’m sure you were very safe I don’t think that you can really blame the cop in this situation for giving you a ticket. If anything it seems like he cut you a break by reducing your fine. Bikes belong on the street!